We’ve got a while yet before we get to the eagerly awaited and short-lived British asparagus season. This year it falls after the equally eagerly awaited and short-lived, but far less healthy, Easter Egg season. You can expect British asparagus to be in season from the end of April through until June. I planted some wild asparagus from crowns three years ago, and cultivated asparagus plants two ago, and so this year I’m hoping we can harvest our first home-grown spears! So am I perturbed at recent news headlines linking asparagus to cancer? No. Nope. Not even slightly. Now, I’m not a doctor or a nutritionist or even a medical scientist, but I was editing a piece for World Cancer Day last week that mentioned asparagine, and I did some research and it’s pretty interesting history for plant nerds. Asparagine is an amino acid, and amino acids are frequently referred to as the ‘building blocks’ of proteins. 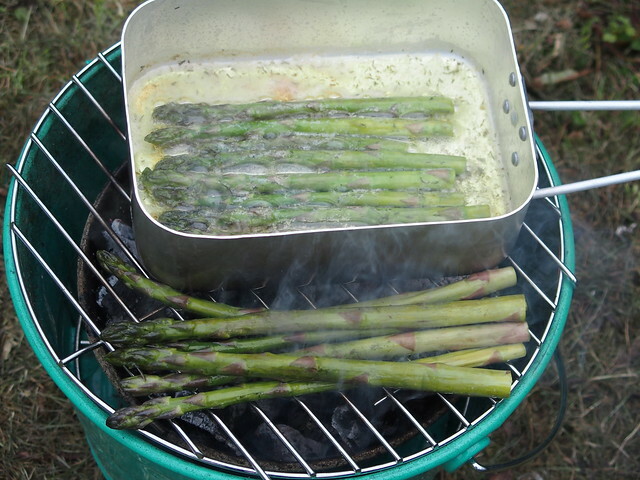 In fact, asparagine was the first amino acid to be isolated, back in 1806, by two French chemists (Louis Nicolas Vauquelin and Pierre Jean Robiquet) and they found it in asparagus – hence the name. Since then it has been found in all kinds of foods, from potatoes, soy beans and whole grains to eggs, meat, seafood and dairy products. Removing asparagine from the human diet would be tricky, and – if truly necessary for a particular individual – would have to be done under medical supervision. Asparagine is non-essential for humans, meaning that the human body can make its own and we don’t actually need it in the diet (unlike vitamins and minerals, for example). What scientists are learning is that the same is not true for cancer cells, in at least some types of cancer. Their work is still ongoing, but the suggestion is that some patients could be helped by having lower levels of asparagine circulating in their blood. It would, quite literally, starve the cancer cells and prevent them from spreading. A very restricted diet isn’t the only solution; there’s an enzyme called asparaginase (and yes, I do feel like I’m conjugating Latin verbs) that helps to break down asparagine into smaller parts, making it unavailable to cancer cells. Investigations into using asparaginase as an anti-cancer drug have been going on since 1953. For starters, I mean, who wouldn’t be? They look gorgeous! Almost masquerading as tomatoes, it’s wondrous. And apparently they have a climbing habit, which is not something you normally see in a sweet pepper.